OHIO JOBS Ohio jobs and justice educates and advocates the enforcement of US immigration law when illegal aliens charged with identity theft, social security fraud, or illegally crossing the US border violating national security, visa regualtions, soverignty, citizenship, and the rule of law. Banks that Market to Illegal Aliens! Would you like to know which Ohio banks aid and abet illegal aliens in the pursuit of profit? While US Border Patrol agents risk their lives protecting our country, some Ohio banks roll out the red carpet for human traffickers and their cargo. 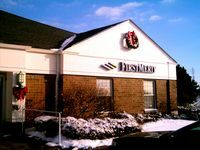 Citizens angry about First Midwest Bancorp's acceptance of the Mexican Matricula Consular ID's (typically used by illegal aliens) led to several protests at its bank branches. The protests, sponsored by Indiana Federation of Immigration Reform & Enforcement (IFIRE), brought unwanted attention to the bank's dubious marketing strategy of accepting the Mexican ID that the FBI has called unverifiable and subject to fraud. First Midwest, formerly known as Bank Calumet, has decided that it will no longer accept the Mexican Matricula Consular Card as a form of acceptable ID. Note: OJJPAC hopes other banks learn from First Midwest's experience and stop marketing banking services to the illegal alien demographic market. The Federal Bureau of Investigation (FBI) has warned Congress that Mexican Matricula Consular ID Cards (MMC's) are unverifiable forms of identification (ID), and should NOT be accepted as a valid ID. However, the above named banks continue to accept MCC's as identification for foreign aliens who want to open bank accounts and use other banking services in the United States. By accepting unverifiable ID's, these banks put Americans and the US at risk because they give terrorists and others illegally in the US access to US banking services--which are used to support criminal enterprises ranging from ID theft to terror cell operations. Is your bank on this list? If it is, call them and ask them to stop accepting the MCC. Demand that these banks stop accepting the Mexican Matricula ID card! Mexican Matricula ID card! Mexican Matricula ID card! Which Ohio bank puts your family's security above profits? OJJPAC recognizes FIRSTMERIT Bank for its good citizenship business practice of NOT accepting the fraudulent Mexican Matricula Consular ID card (MCC) as proof of identity. FIRSTMERIT's policy prevents illegal alien criminals and terrorists from using a MCC to access banking services to support criminal activities. Unfortunately many other banks put greed above loyalty to YOUR FAMILY and the USA. © 2006-2018 Salvi Communications. All rights reserved.